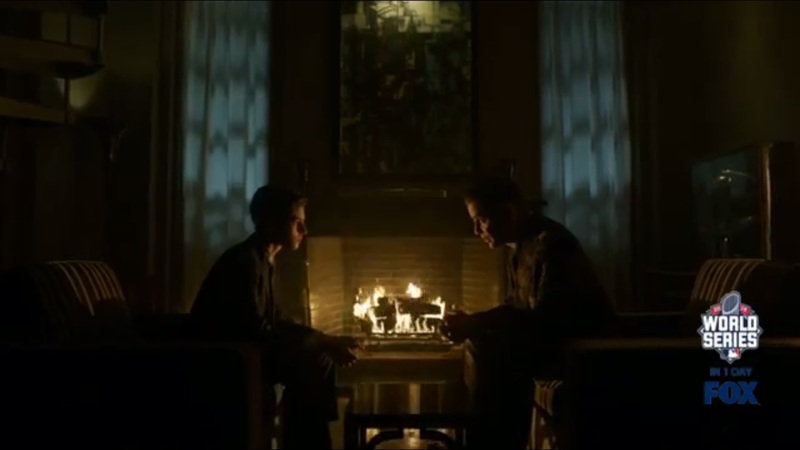 A Look at Gotham- Season 2, Episode 6: “Rise of the Villains: By Fire” | What Else is on Now? The episode begins with Butch telling Galavan about Penguin going crazier than he’s ever been before. Apparently Butch set up the raid. He’s a traitor and a rat. Butch explains that he got away when Penguin slipped on some of the blood. Butch ran as far as he could, and the next thing he knew, he woke up at the hospital. All he wants is for Theo to give him a shot. Theo wants to help, but he already has several capable folks already. But then, they don’t know Gotham like Buch does. Theo eventually believes Butch, but Barbara remembers that Butch once held her hostage one time. Even still, at this point, Butch has nowhere else to turn. Tabitha and Barbara are more into the idea of what they can put on Butch’s stump. Eventually, Theo welcomes Butch to the team. Oh, and a congressman hanging in the background. He eventually decides to back Galavan, and that’s what gets him cut down. We then cut to Jim running after a perp through an alleyway. He’s intercepted by Strike Team. 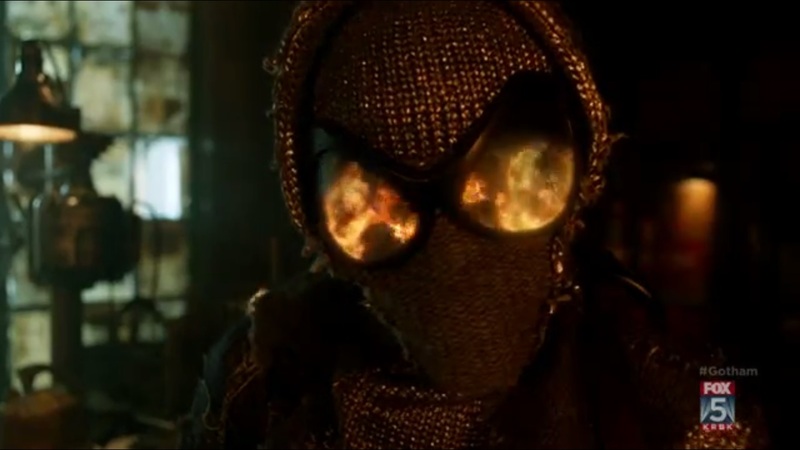 Jim wants information related to Luke Garrett’s death, but this guy isn’t a firebug. Jim decides to violate protocol by knocking the guy around, but he’s more focused on getting information. The perp hasn’t heard of a female firebug before. The two Strike Team members tell Jim that they’ve been authorized to report any infractions, even by superior officers. Go right ahead. So Bridgit is cleaning up at Selina’s less than homely home. She can’t sleep and doesn’t know what to do with herself…apparently that’s the point of being free, Selina says. But Bridgit killed someone. She doesn’t have the money to get out of town, but that’s apparently no problem for Selina. Selina admits that she’s only helping because Bridgit reminds her of herself…if she was a doofus. You’re not far off, Selina. Trust me. We then cut to a shady underground location. Two women are brought up not to fight, but be sold. Bridgit and Selina watch from above, but they’re there to steal the money- not help these girls. Selina gives Bridgit instructions to bust a safe she already busted. After that, wait for Selina to make her move. Selina slips in, climbs onto the cage, and knocks out the announcer. Somehow, Bridgit managed to get past everyone as well. 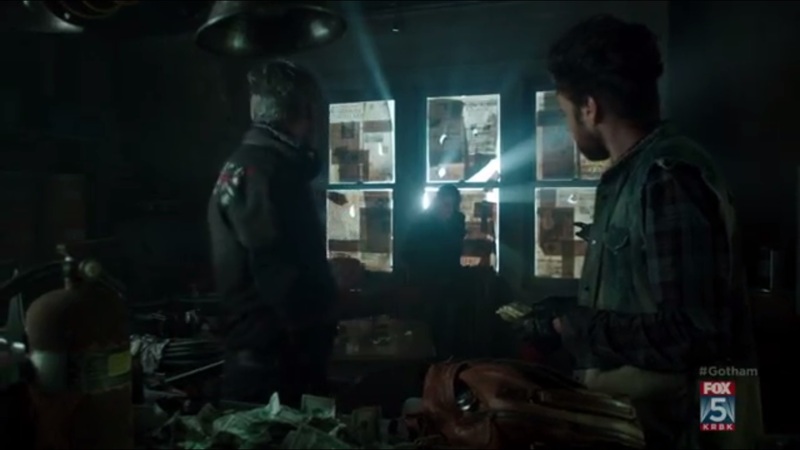 Because this is Gotham, everyone present turns over their cash and valuables to a pair of little girls. Bridgit leaves, paying no mind to the trapped women. At GCPD, Barnes puts a note in Jim’s file for beating up suspects. Barnes gets it. Luke was a good kid and meant to be ready for this city, and now he’s dead. This is war, but this doesn’t give GCPD the license to break the law. There’s a line. Butch learned that the hard way, but, Jim returns, this is Gotham and there are gray areas. He learned that the hard way. Luckily, Barnes has available surveillance footage from last night’s raid that identifies both Bridgit and Selina Kyle. Good thing there was apparently a surveillance camera capturing this and that the coverage of a trafficking ring robbery was airing just when Barnes turned on the television. Jim recognizes the other person besides Bridgit, but he doesn’t give her identity to his commanding officer. Why? I have no idea. 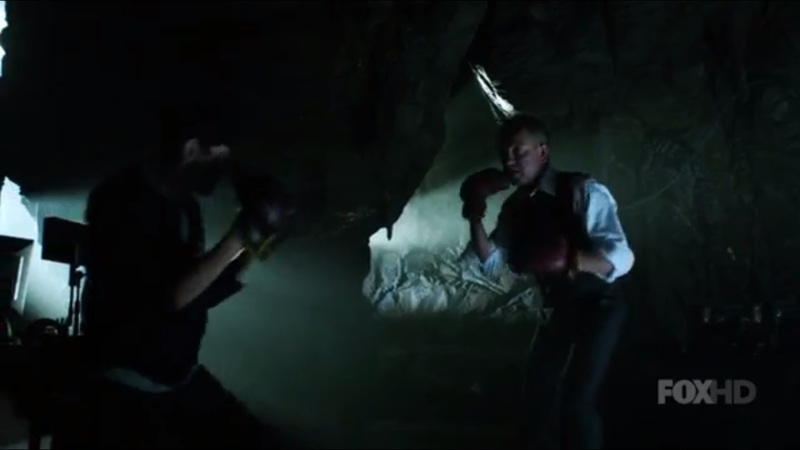 At Wayne Manor, Alfred teaches Bruce to box- again, mind you- and how to not dance like a bloody schoolgirl. Also, your enemies will fight dirty, which prompts Bruce to bite Alfred. The computer will be fixed by Mr. Fox soon. Also, Silver St. Fox called and wants to go to dinner with Bruce. 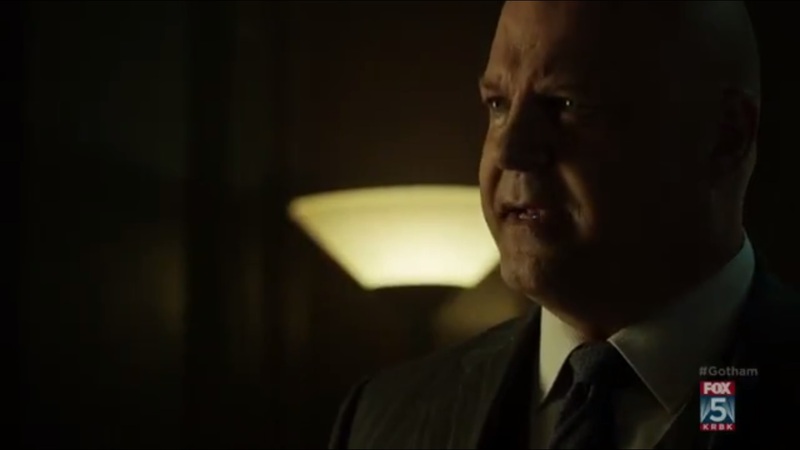 That causes Bruce to stop…and gives Alfred enough time to sock him in the face. 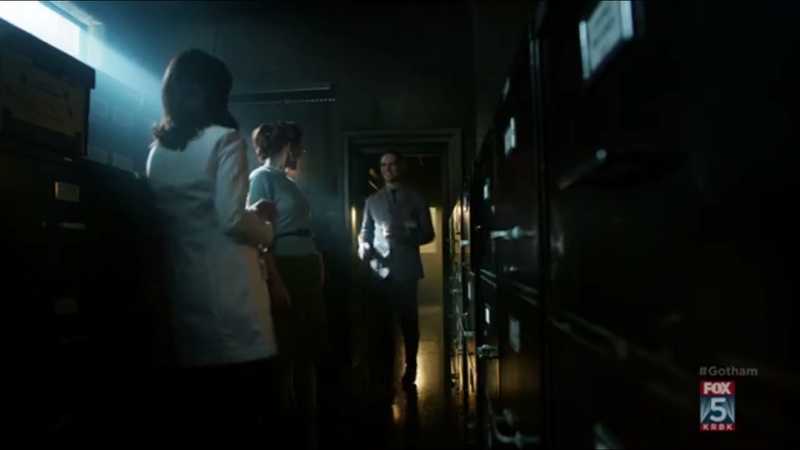 Nygma overhears Kristen talking to Leslie about her ex, who she feels could be dead. It worked out for the best, she says. She calls him gentle…almost too gentle. A man needs to have a little fire and danger in him. 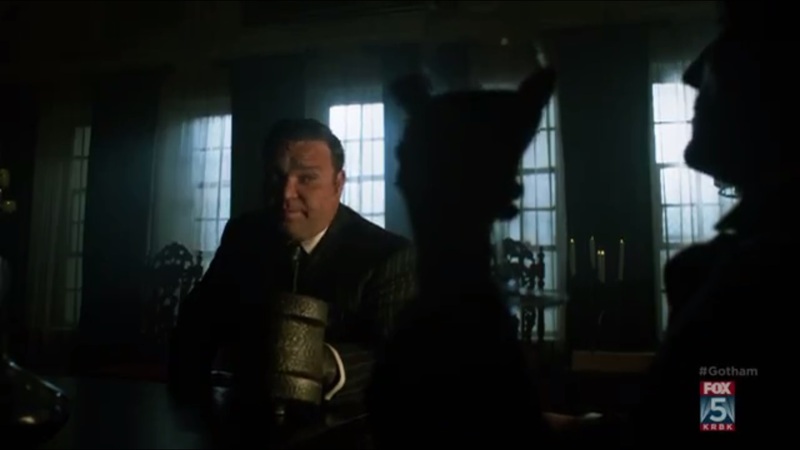 Also, she thinks that Nygma could be holding something back from her. All she wants is for him to open up. Hey! What do you call a three legged cow? Lean beef. This is Nygma’s riddle as he enters and invites Kristen to supper at his place. Okay, time for some ginger to ginger talk. 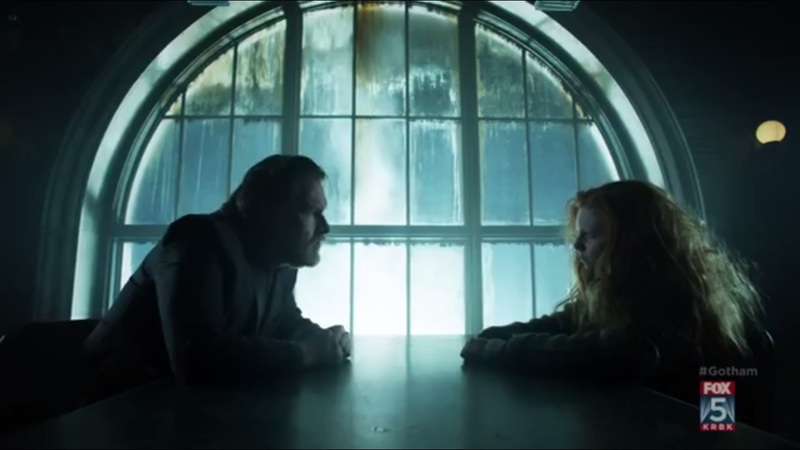 At GCPD, Clare Foley returns as Ivy Pepper, who is interrogated by Bullock on Selina’s location. She’s not cooperating at first, but she will with a candy bar. Jim, meanwhile, has struck out. She’s in a condemned SRO off of Jenkins, Bullock confirms. He thinks that he and Jim should watch their step around her. Selina sees Bridgit out of town. Bridgit thanks her for her help, but come on, you know we’re not done yet. This goodbye is interrupted by a speeding van. The Pike brothers emerge and pick up Bridgit. 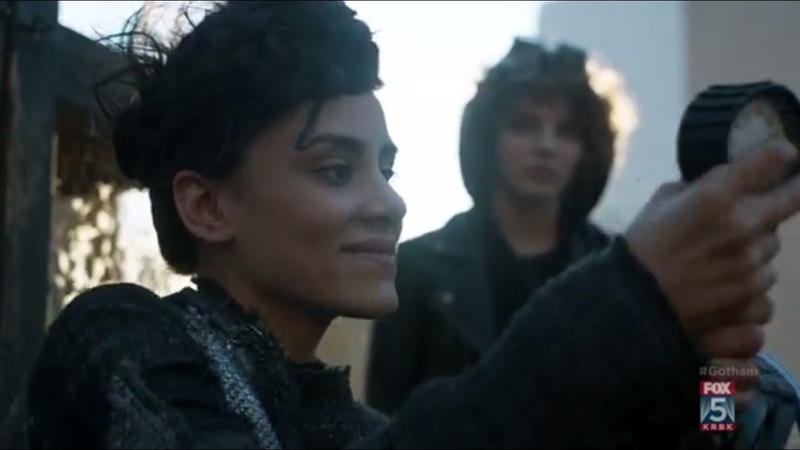 Selina manages to pick off one of their guns, but does not use think about using it on the speeding vehicle. Not long after, Selina loads up on ammunition just as Jim arrives at her location. He bursts through the door and the two find themselves at a standoff. Selina claims to not know about Bridgit, but she also says she was forced into doing all those horrible things by her brothers. What Selina doesn’t know is why the Pikes burned down a Wayne Enterprises building. Jim tells Selina that there a lot of angry cops that may shoot Bridgit unless Jim gets to her first. Selina gives up her name and the brothers as well. At first, Selina refuses Jim’s help. She claims that Bridgit is no one to her except a girl in the neighborhood. Jim gives his word that he’ll keep her safe, but Selina has to stay out of it. So Joe and Evan count Bridgit’s money while she’s chained to the radiator. They’re pissed that Bridgit left. Joe throws sparks in her direction, furious at her betrayal. Does she want to be part of this family? She eventually says yes and is released, but she won’t go too far. If she tries it again, both she and Selina will die. Instead of making supper, Bridgit heads off. Butch’s hand is replaced by a mallet, which is actually kind of funny. His news for Penguin is that he’s in and asking questions. If he pushes too far, Galavan will be onto him. 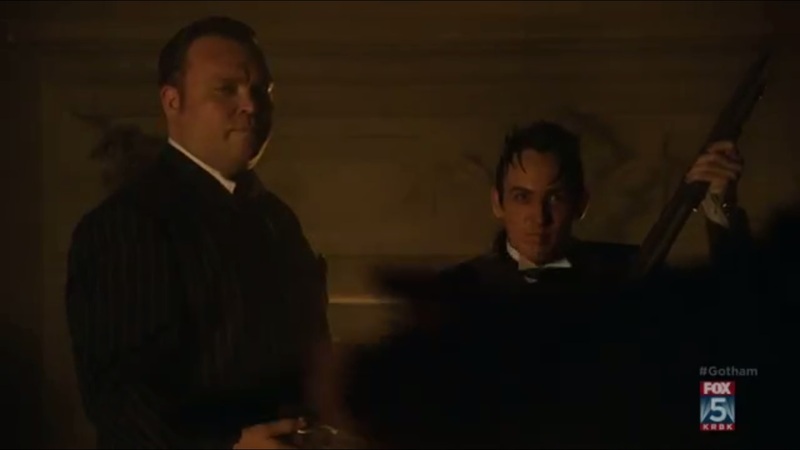 Penguin, frustrated at this lack of an update, asks Butch if he’s his servant and still obeys him. If so, why does he bring excuses? Go find Mom before Penguin chops off another hand. So Joe and Evan screw around and don’t notice Bridgit until she arrives in her Firefly costume. Yeah, she burns them. Well, those were brothers. Jim and Harvey arrive at the Pike location and find two charred bodies, but no Bridgit. But one is still barely alive and scares the hell out of Bullock, who kicks him…apparently to death. But why would Wayne Enterprises hire these arsonists? Bullock is more concerned with finding the freaky chick arsonist. Butch does some snooping at Galavan’s and watches surveillance of Mama Cobblepot when Theo pops in. He promises Butch a good future due to his loyalty. If only he was loyal to Galavan instead of Penguin. 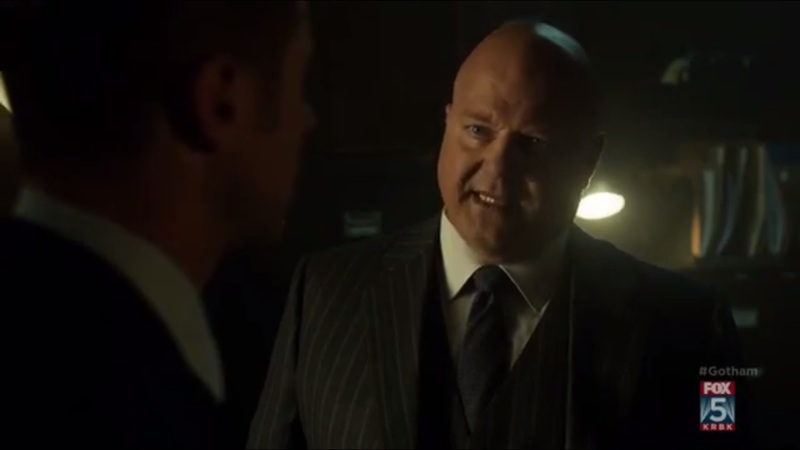 Yeah, Theo is wise to Butch’s plan, but how did he get Penguin to do that? He’s a servant due to tinkered wiring. Tabitha enters with her whip. Theo tells her that Penguin has brainwashed him and needs help. She wraps her whip around Butch’s neck and strangles him until he passes out. 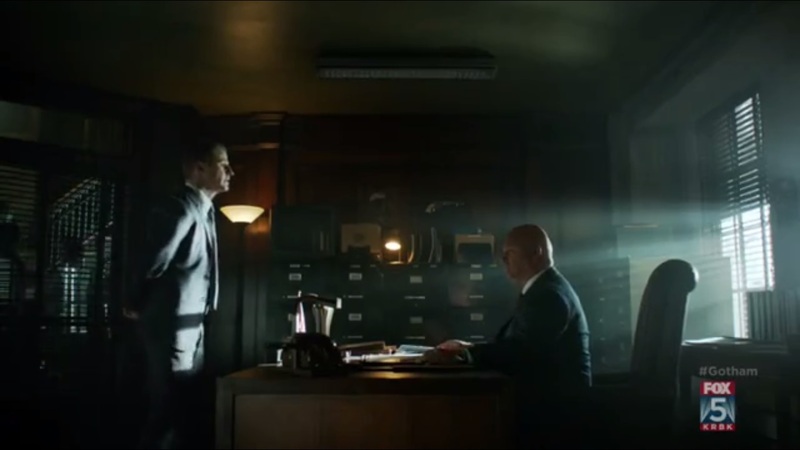 Back at GCPD, Jim tells Barnes that a perimeter has been set up and officers are keeping watch on Selina Kyle as well. Jim tells Barnes about Bridgit’s abused past and how he promised his informant that Bridgit will be kept safe. 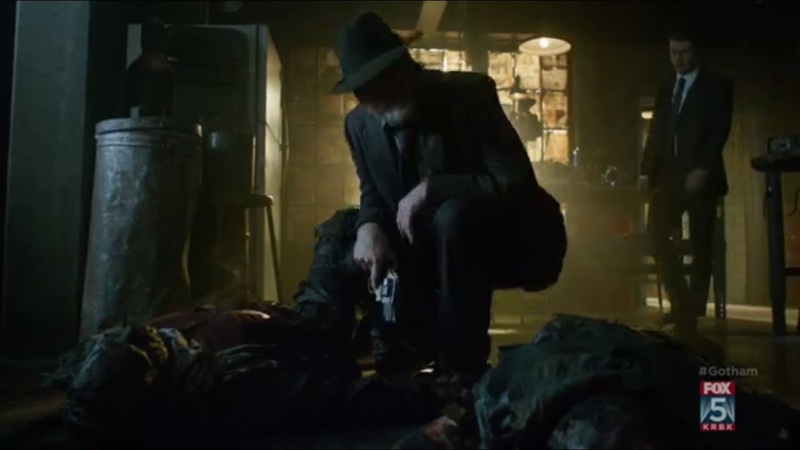 However, Jim also talked about Luke Garrett’s future, but he’s now dead. Don’t make promises you can’t keep. Barnes tells Jim to take down Pike, no matter what. Selina finds Bridgit on a rooftop where they used to watch birds. 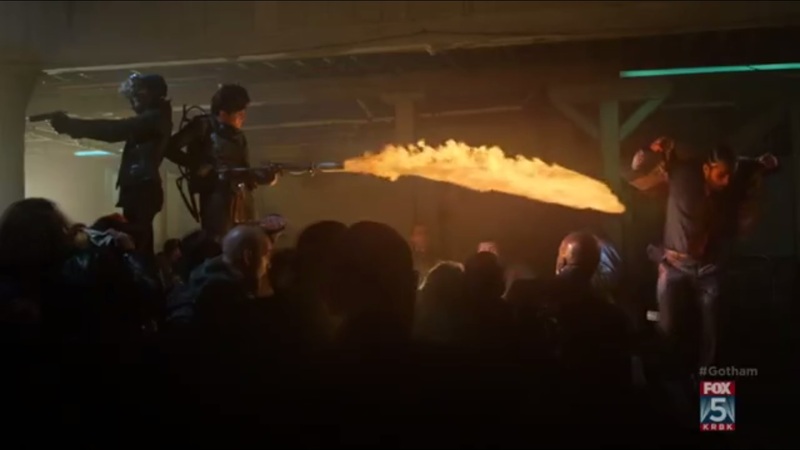 As Selina talks up old times, Bridgit works on her flamethrower. She’s not afraid of them. She’s not herself anymore- she’s free, just like Selina said. She’s going to go after the rest of the people who hurt them. Selina claims that no one ever went after her. Also, rule number one: look after number one, that’s you. These are the rules of the streets, I suppose. She begs Bridgit not to do this or she’ll get herself killed. But hey, Selina doesn’t care, mind you- she just thinks that Bridget is being dumb. Oh, and she hugs Bridgit. I wonder if that will be important later. 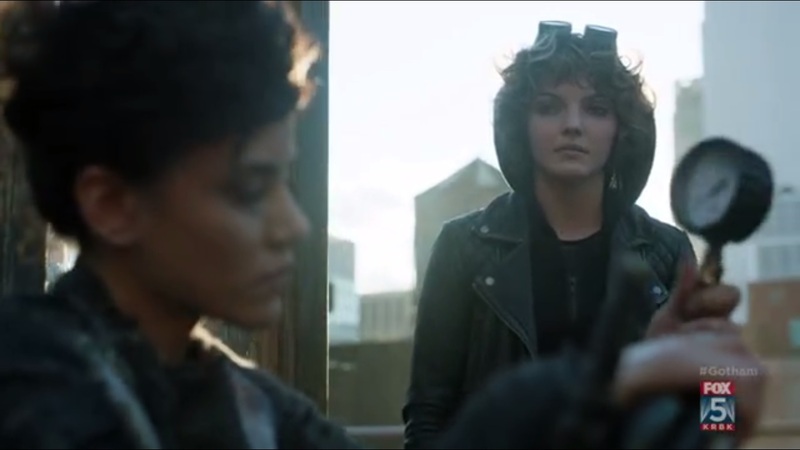 Not that I’m asking for consistency on Gotham, but Selina? Please make up your mind. First, you wanted this girl to be free, stay strong, not let anyone push her around, and now you don’t want her to cross certain lines. Pick one. That evening, Theo has dinner with Bruce and Silver St. Cloud, though Tabitha joins with a bit of blood on her cheek. Theo toasts to family- at the end of the day, that’s all that matters. Theo hopes that, in time, Bruce will think of them as family. It’s been some time since Bruce had a dinner like this. He and Silver can, you know, hang out and whatever. 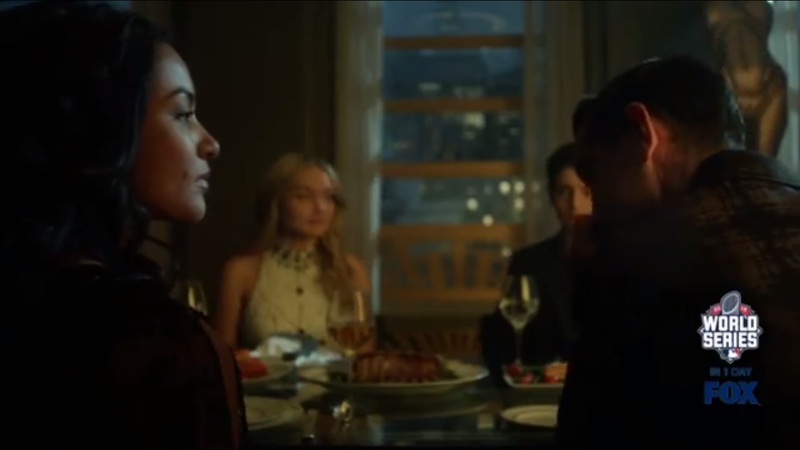 So Kristen and Nygma have that supper. He wants nothing more than to spoil her- which Kristen finds forceful. And nice. He also tells her something that he hopes won’t scare her away: he likes her very much, but this is interrupted by a kiss. 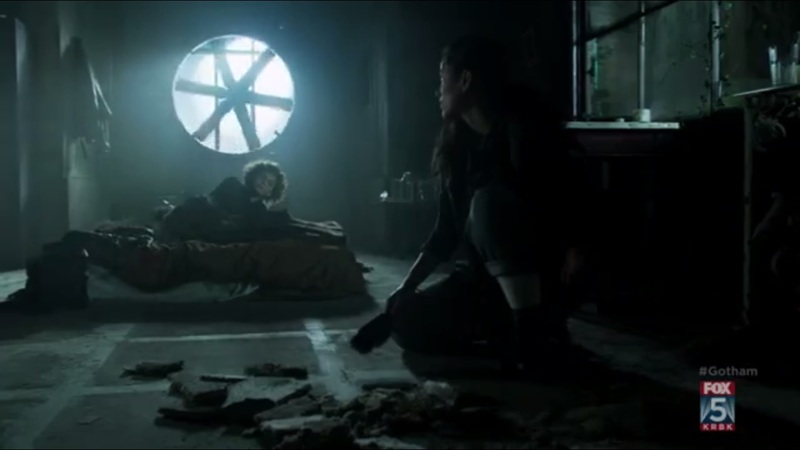 Then Kristen spots Nygma’s bedroom. I just hope it’s not decked in question marks. At GCPD, Jim has a phone call. Selina reminds Jim of his promise and tells him Bridgit’s location. 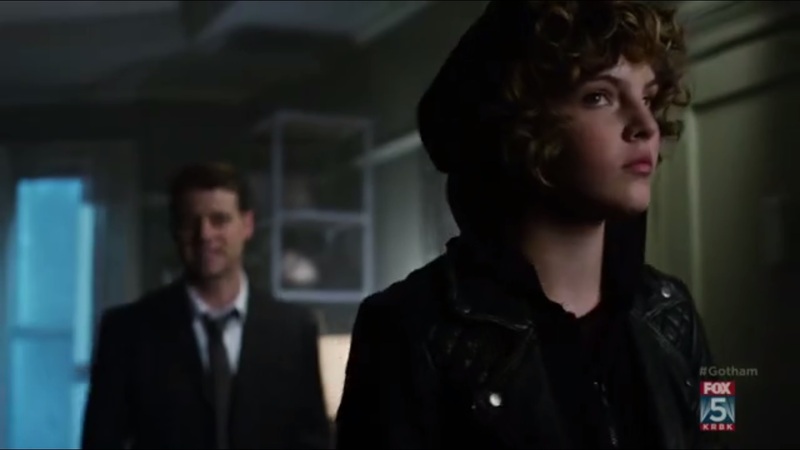 Part of me wonders why Selina didn’t just walk into the GCPD since it’s easy enough to slip in without problems. We return to the trafficking ring as Bridgit frees the trapped women. 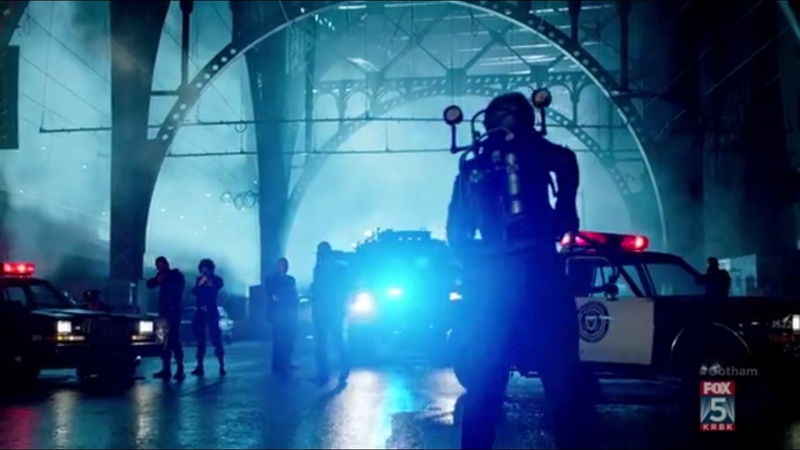 Gordon, Barnes, and Strike Team arrive at the scene and confront Bridgit. Jim steps forward, saying that he knows Bridgit didn’t mean for any of this to happen. She was forced and Jim believes that. She won’t have to go to jail. She’s a juvenile, so there can be an arrangement. Unless she went Jerome levels of crazy, I guess. Bridgit’s suit starts to leak, but she sprays away anyway at the cruisers. 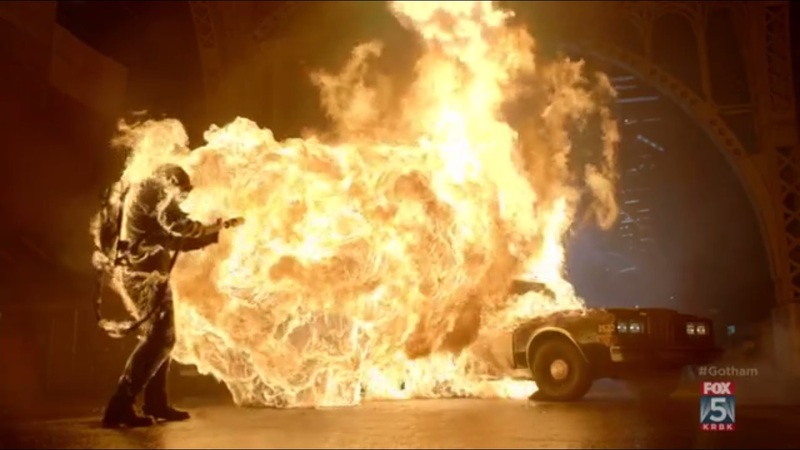 One goes up in flames and the explosion spreads to Bridgit. She falls to the ground and screams in horror. Now, Bridgit, what did you think was going to happen? 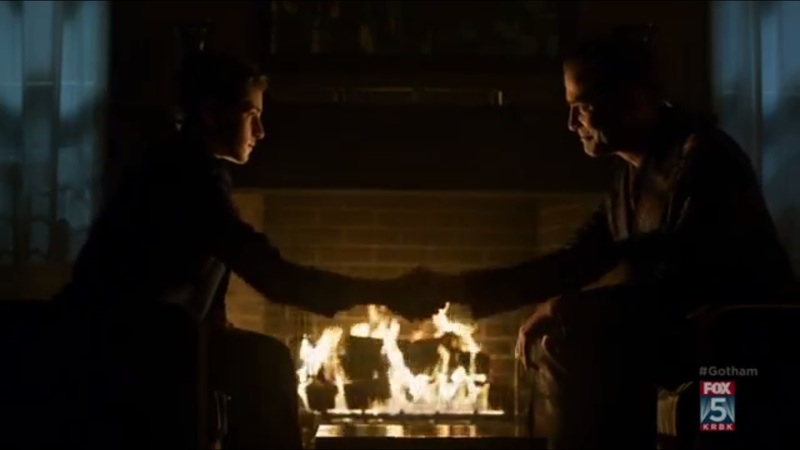 Theo and Bruce have a moment alone to talk. Theo talks about an executive at Wayne Enterprises who has been reported missing- Sid Bunderslaw. Bruce confirms that they’ve met. No one knows what happened, but it’s not good so far. Theo has been following the going-ons at Wayne Enterprises for a long time and knows that Thomas Wayne was a good man. Despite that, bad things happened to his company. And Theo knows that Bruce cares about this. Once Theo becomes Mayor, he’d like to be the person to help Bruce. Bruce, in kind, appreciates the offer. Again, they shake hands. This is how you seal the deal. 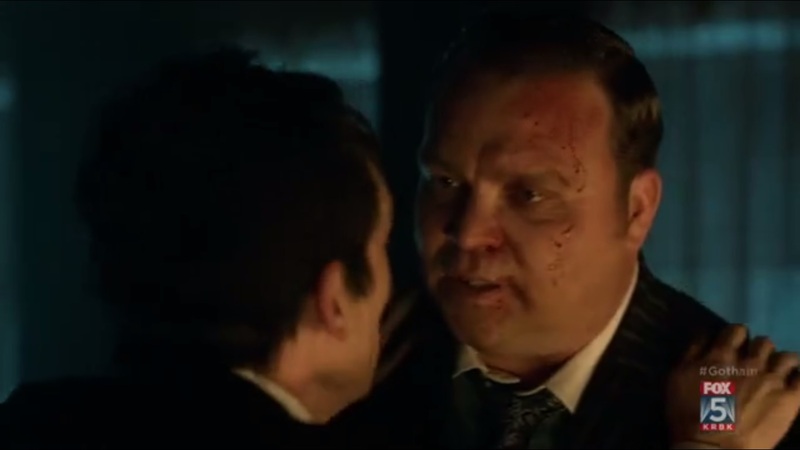 A bruised and beaten Butch confronts Penguin with his mother’s location. They have to go now. Penguin promises that Butch’s loyalty will be returned. He heads off to gather the troops. 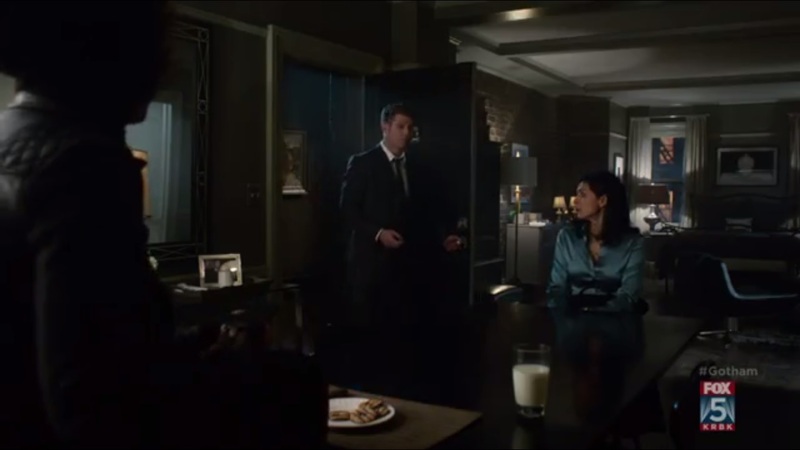 Selina has small talk with Leslie Thompkins. 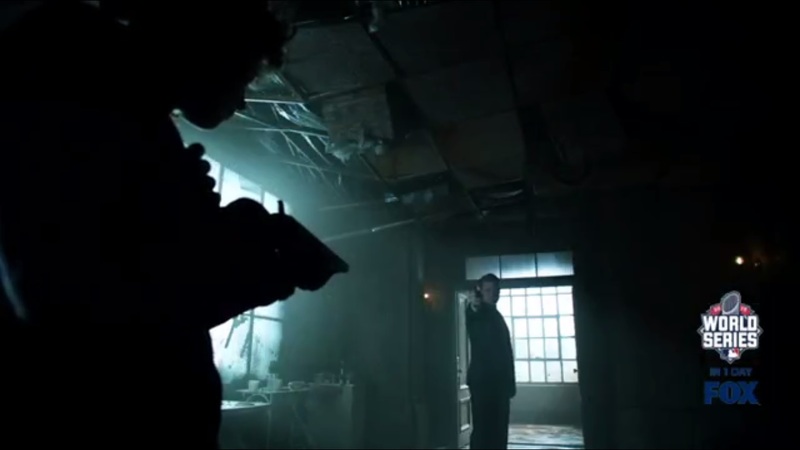 Jim arrives and Selina lowers her weapon. Unfortunately, Jim tells Selina that Bridgit isn’t going to make it. She didn’t want to go quietly. It’s like she wanted it to end this way. Selina, who claimed to not care about Bridgit, tears up at this news. Jim still needs to know who hired the Pike brothers, and Selina claims to still not know. It’s not like Jim is going after his little friend. Like Penguin. Why would Penguin hire them? Selina sulks off, telling Jim that he doesn’t care about people like her. She even lambasts him when he says that he wanted to save Bridgit, but things went another way. She leaves, promising to never talk to or trust a cop again. Sorry, am I supposed to care about Selina’s plight right now? Back to Nygma and Kristen, who is afraid of Tom Doughtery. He used to tell her that if he saw her with another man, he’d kill her. Nygma tells her that she does not need to worry about him. Kristen tells Nygma that he’s not a fighter and couldn’t possibly take him on. What does that mean? Nygma tells her of their altercation. Long story short- he killed him. But Kristen laughs. Then Nygma continues, telling of how Tom was outside of her apartment. He even still has Doughterty’s badge. A now shocked Kristen wants out of this, surprised that Nygma would do this. She calls him a psychopath and claims that horrible things will happen to him in prison. 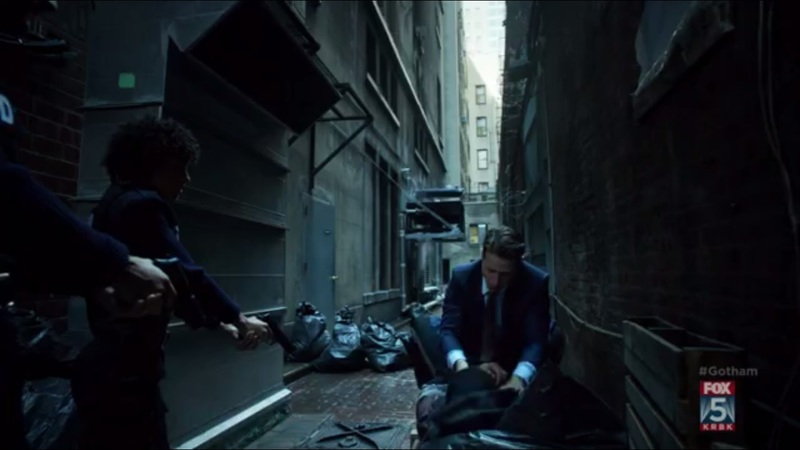 Kristen hits Nygma over the head a few times and tries to escape. So Nygma covers Kristen’s mouth with one hand and puts another around her neck, telling her how much he loved her. Kristen’s lifeless body slumps to the ground. 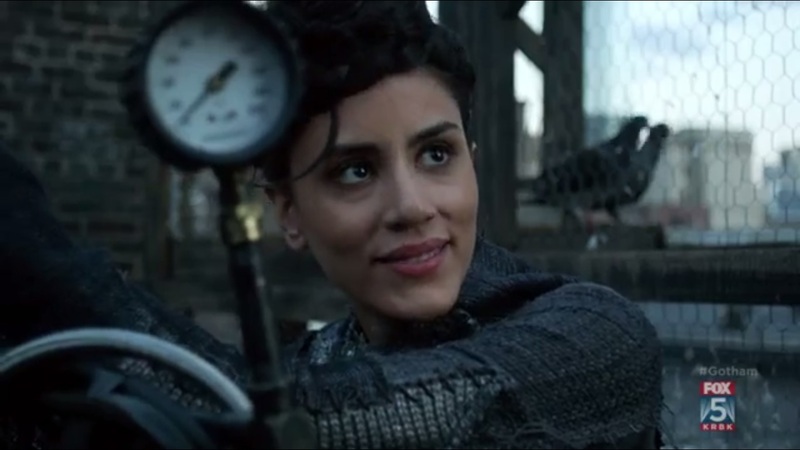 It’s from Nygma’s tight grip, but maybe she decided death would be better than a relationship with Edward Nygma. Elsewhere, Penguin’s team locks and loads. While Selina cries by the bird cage. Two doctors, meanwhile, move Bridgit’s body to a site for testing. Apparently, she was only mostly dead. There’s a big difference between being mostly dead and all dead, you know. 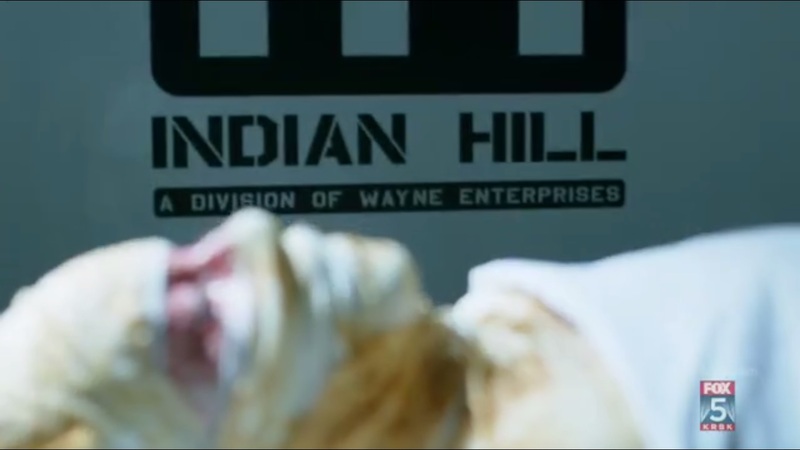 Bridgit is brought into Block 3 of Indian Hill- a division of Wayne Enterprises. Where do I even begin with this episode? Well, I’ll start with the stuff I liked. Or, at least, sort of liked. Barnes’ demeanor. 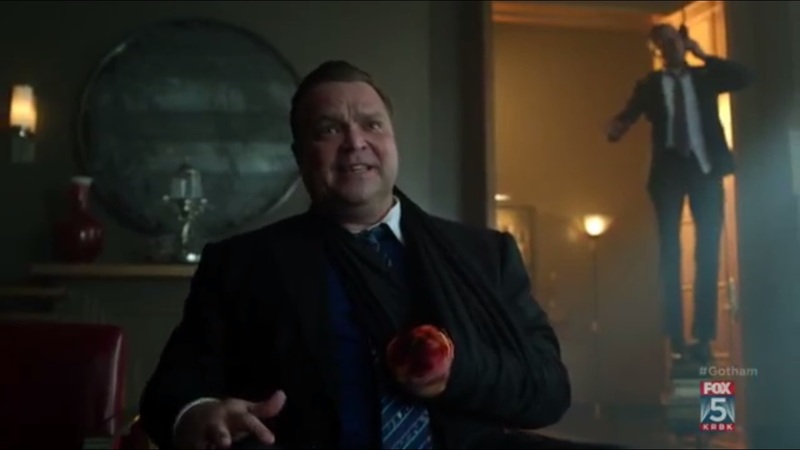 He was brought in to clean up the GCPD and, so far, he’s living up to that promise from what we’ve seen of him. I would figure he has a bigger presence, but here, like Essen, he’s mostly at the department. And he’s even more of a boy scout than Jim, given how he reamed Gordon out for his brute force against a potential witness. Barnes is very much by the book and it doesn’t matter if Jim is out for blood. There are rules. But then he’s committed to taking down Bridgit Pike. He doesn’t say by the book- he just wants her brought down. I get that he wants to avenge Luke Garrett’s death and I like how he calls Jim out on his double talk, but either he wants Pike taken down or brought in. If it had been left to him, part of me wonders whether Barnes would have killed Pike. 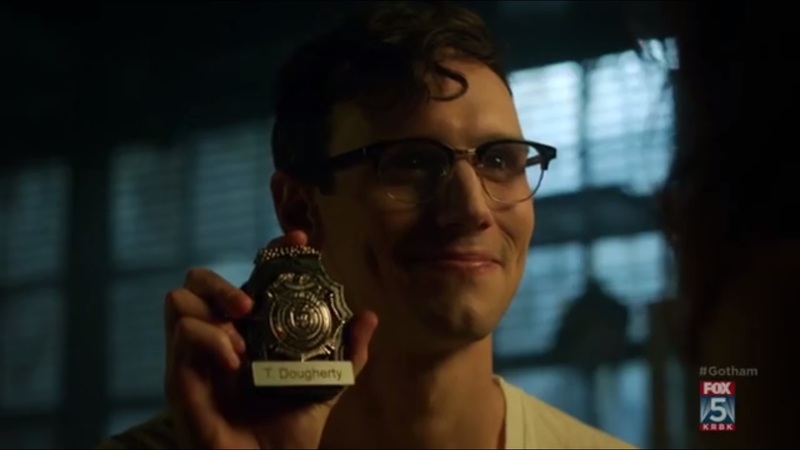 Nygma overplayed his hand and let his confidence overwhelm him. So instead of just one, he now has two murders on his hands. It’s unfortunate not just because I find Chelsea Spack to be incredibly attractive- though that’s a big part of it- but there seemed to be something going there with her softening up to his weird side. Her revealing what she wanted to see from Nygma pushed him to be even more assertive instead of playing it cool. So, like any other person, she’s horrified that Nygma would commit murder and stalk her. There’s a line you don’t cross and Nygma did just that in regards to his feelings for Kringle. 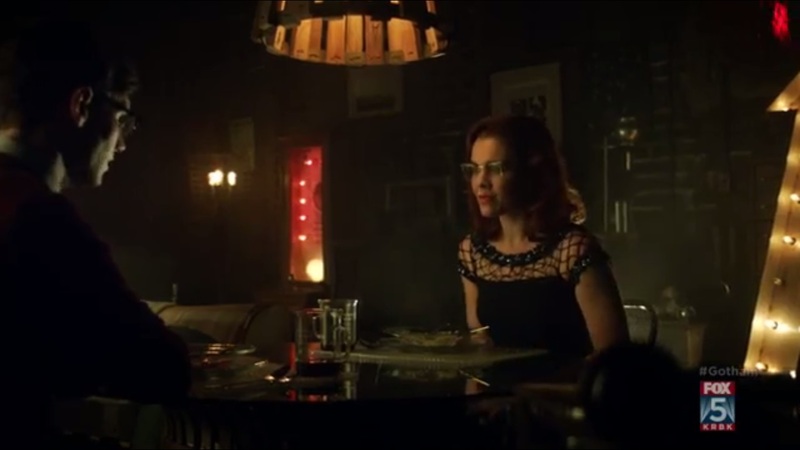 It feels like a waste because these two didn’t start getting serious until this season, but now she’s dead, leaving Nygma to go even madder than he already has. Theo continues with his game of getting in Bruce’s good graces, and right now, he’s on the right track. He needs Bruce’s trust, so he also latches onto the conspiracy going on in Wayne Enterprises. Like Jim and Alfred, Theo comes off as a father figure to Bruce, which helps since Bruce doesn’t have that family dynamic right now and it’s nice for him to have some semblance of a family. Though, this being the kid who would grow to become one of the world’s greatest detectives, I wonder if he senses anything off about Theo’s intentions. If anything, it’s good that Theo and Tabitha were able to smell Butch’s intentions from the start. So now Butch looks to be playing the same sort of double agent game that Penguin played. But I don’t see how Theo can call Butch such a loyal person when he’s done little to prove it in his eyes. The main storyline with Selina and Bridgit annoyed me to no end. First off, Bridgit’s motivation and Selina’s pushing felt very haphazard. First, Selina wants Bridgit to be assertive, but not too assertive. If Bridgit isn’t careful, she could get herself killed, never mind that Selina has killed before and gotten herself involved with mobster types like Fish Mooney and Penguin. Sure, Bridgit’s brothers deserve a hefty amount of blame for bossing Bridgit around the way they did, but Selina set her over with her brand of encouragement. Selina made such a big deal of being free and living as she wanted, as if she wanted Bridgit to walk a similar path. But now that she did, she fears her going over the deep end. She even tries to justify the bad things Bridgit did by saying the abuse by her brothers pushed her to this point. 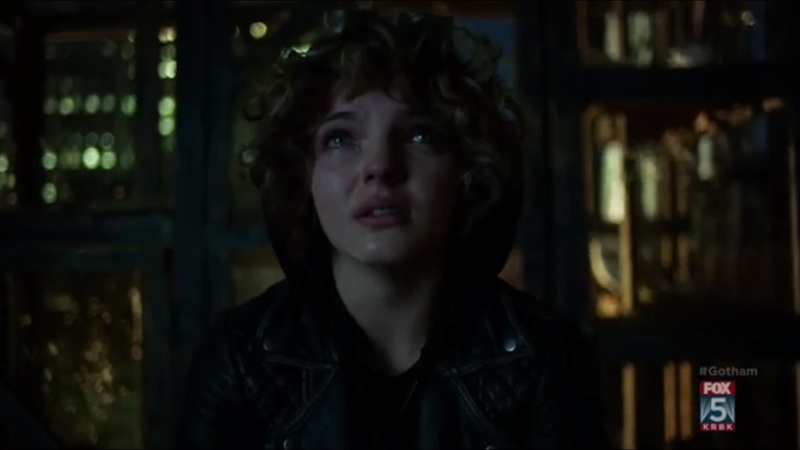 That doesn’t excuse what the two of them have done at all and Gotham doesn’t do much to make me sympathize with either Selina or Bridgit, even after she goes up in flames. Her transformation from abused teenager to pseudo psychopath happens too fast for there to be any sort of realistic character development. In the span of one scene, she goes from being handcuffed by her brothers to setting them on fire. If she’s had this anger inside her all this time, why wouldn’t she do this as soon as she put on the suit the first time? Why even go with Selina if she was so hell-bent on revenge? This could have been the first thing she did after suiting up. But then, she is wanted, so not like she can just roam the streets of Gotham. She makes a big deal about wanting to get back at bullies and abusers, whom we never see outside of her brothers, so I don’t feel the extra sympathy I should because her dark turn is too fast to seem realistic. An episode that focused on just her would have been nice. Maybe she gets in over her head or something and doesn’t follow through on a potential murder. And Selina doesn’t help, either. She claims multiple times to not care about Bridgit, when she really does. Selina’s never been afraid of speaking her mind, so she could just come out and say that she cares about her. She wants to have her cake and eat it too, being the supportive, yet distant friend. She’s motivated by desperation because she worries that Bridgit will do something stupid, which she does, but Selina gave her the push she needed. Sticking with Selina for a second, her relationship with Jim irritates me. She only wants his help when it suits her, but she also wishes that she never trusted him. Okay, so why continue telling him about Bridgit? Why not do it yourself or, hell, get Penguin’s help since you work for him? And she flips out on how Jim reacts to Bridgit’s supposed death, when she didn’t think twice about pushing Reggie out of a window? That’s ridiculous. I also wasn’t a fan of the bit with women being sold because it didn’t serve the story other than to make Bridgit into some sort of savior. She sees some helpless women that she’s never met before, and now that she has the power to fight back against abusers, she’s going to help those who are as powerless as she was. But her whole reason for being here was to get money, so saving some girls as a bonus doesn’t turn you into a saint. Plus, I hesitate to believe that a big crowd would cower in the face of two young girls. 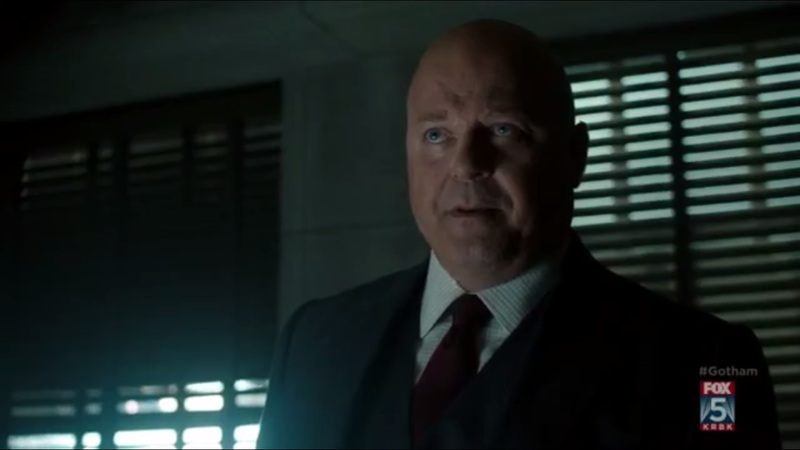 Well, at least there’s that ending with Indian Hill, which we’ve heard Maroni and Falcone allude to a few times last season…but now it’s under the banner of Wayne Enterprises. Interesting way to end the episode on, even if the location looks like that hall of secret projects from The Amazing Spider-Man 2. “By Fire” isn’t as entertaining as “Scarification” and it’s a so-so way to wrap up this two parter. Sure, having Bridgit alive leaves the door open for her to return later, but even then, I’m still not invested in her storyline. Meanwhile, Nygma continues down a dark path, Penguin appears to be on the path to rescuing his mother, and Theo continues his quest for greatness. Not the show, though. That’s still just trudging along. Oh, and who the hell is this? This entry was posted in Gotham and tagged Alfred Pennyworth, Barbara Kean, Ben McKenzie, Bridgit Pike, Bruce Wayne, Butch Gilzean, Camren Bicondova, Carol Kane, Clare Foley, Cory Michael Smith, David Mazouz, DC Comics, Detective Alvarez, Donal Logue, Dr. Leslie Thompkins, Drew Powell, Edward Nygma, Erin Richards, Firefly, FOX, Gertrude Kapelput, Gotham, Harvey Bullock, Ivy Pepper, J.W. Cortes, Jessica Lucas, Jim Gordon, Joe Pike, Kristen Kringle, Leo Fitzgerald, Michael Chiklis, Michelle Veintimilla, Morena Baccarin, Natalie Alyn Lind, Nathaniel Barnes, Noah Robbins, Oswald Cobblepot, Penguin, Robin Lord Taylor, Sean Pertwee, Selina Kyle, Silver St. Cloud, Tabitha Galavan by omarid513. Bookmark the permalink.